Aquarium algae – it's not like the plants that adorn your home vadimchik, and that aquarists strive to grow in your underwater garden with fish. It is fouling on the walls, ground, and other plants that have unsightly color and often smell. To grow them is not necessary, they appear by themselves, usually in aquariums with disturbed biological balance. Aquarists from the vegetation struggling to get rid of, although it is not always easy. But eye pleasing aquarium plants need care and attention. tests to determine the level of acidity. 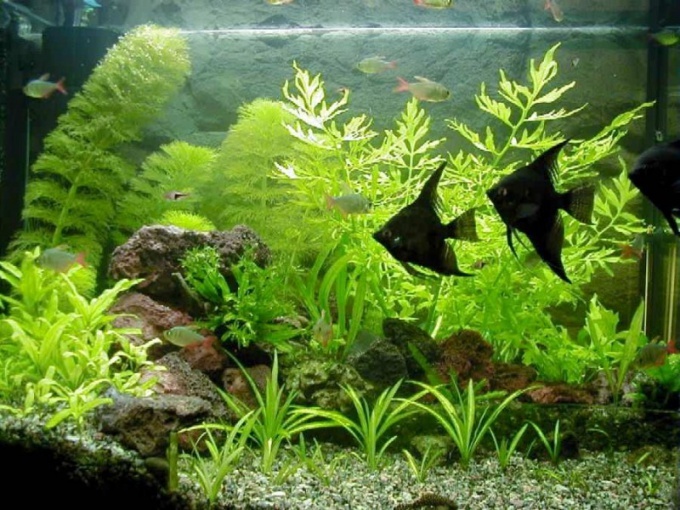 To grow aquatic plants are sometimes more difficult than fish. To enhance your "garden" pleasing to the eye, you need to provide him with certain conditions. Pay attention to the lighting of your aquarium. Daylength needs to be within 10-12 hours. In addition, it depends on the brightness of the lighting. Brighter than it is, the shorter daylight hours. However, if the duration of the illumination is small, there is degeneration of plants. Too long of a light day leads to the development of algae. Install the lamps. Their choice is determined by the volume of the tank, and the type of cultivated plants. If the lighting is incandescent, then for each 1 liter volume requires 1.2-1, 5W. If fluorescent, then 0.4-0.5 W. For light-loving plants, increase the capacity to 0.8-1.0 W. Enough for undemanding 0.4 W per 1 liter. the Spectrum of the lamp is also important. In the growth period of the plants – red and yellow. Flowering and fruiting – blue. Plants need carbon dioxide. If the population of your tank corresponds to its volume, and the illumination does not exceed 0.5 W per 1 liter, it is enough that comes from the external environment and is formed in the process of fish waste. Otherwise, the carbon dioxide must be fed forcibly. Purchase or make yourself from Kipp apparatus, in which the carbon dioxide produced in the chemical reaction between chalk and acetic acid. This is the cheapest option, it is able to provide gas to small aquariums. For aquarium soil is most suitable quartz, granite, basalt. The optimum particle size 1-5mm. When using fine sand the roots of the plants are pressed and rot. Ground lay with the tilt – glass front 4cm, back 7cm. Purchase a nutritious substrate for plants. Place it under the ground. If plants a bit, you can put clay or basal pills. Under the influence living organisms in the water changes the level of acidity. Sudden change has a negative impact on living organisms, and even lead to their death. Purchase the special tests by which you will be able to control the level of acidity of the water in the aquarium.